Periodic security checking, particularly on cloud server is important. 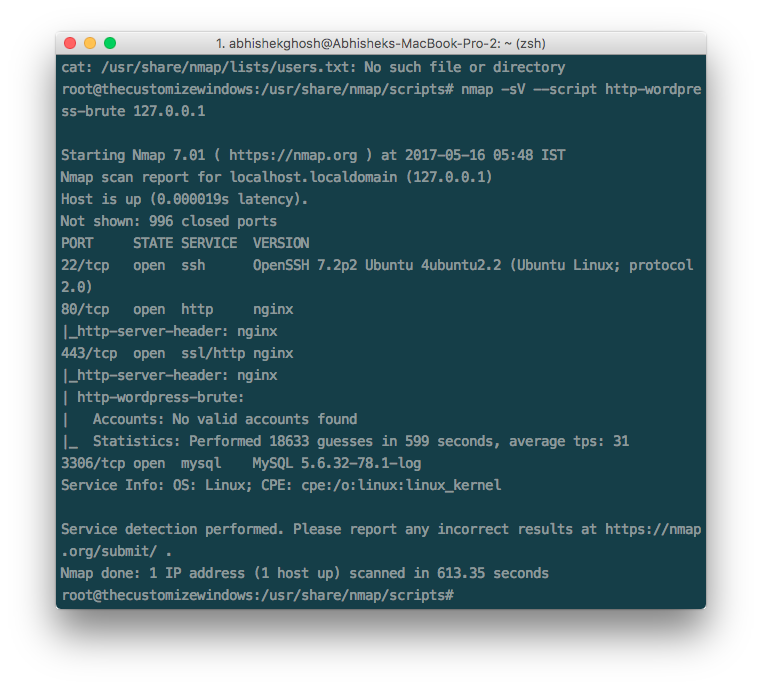 Here is how to perform WordPress security test with Nmap NSE scripts. Previously we have some important guides like for brute force vulnerability checking(it is important to read before this guide in case you are completely new). In this guide we are showing quite basic things including installation, reading help of the scripts, running the scripts. NSE script is a big topic and actually it is beyond our capability to go in depth. But knowing and doing these basic operations will help to slowly learn the terminologies and tricks yourself. We are using a Ubuntu server running WordPress for this guide’s examples. Reconnaissance is crucial to a successful penetration test. Without proper reconnaissance, closing an exploit is going to be a guess work. You’ll see installation of custom Nmap scripts for that repo is written. After test is done, do not keep the scripts on publicly available directory. This Article Has Been Shared 2143 Times! Many Users Complain of Not Working OCSP Stapling in Nginx or Facing Chain Error. Here is Working Step by Step Guide on OCSP Stapling Nginx. Here Are Steps To Update letsencrypt to certbot For the Users Who Used Former Before letsencrypt Became certbot. It is Mandatory For Ubuntu. Few Costly Paid SSL Have Support For ECC. Let’s Encrypt Supports For Free. Here is How To Generate Let’s Encrypt ECC SSL (ECDSA) Certificate. SSH Brute Force is Known Way to Blow Away. Here is How To Limit SSH Access By Country To Save From SSH Brute Force & Filter With Fail2Ban. Cite this article as: Abhishek Ghosh, "WordPress Security Test with Nmap NSE Scripts," in The Customize Windows, May 16, 2017, April 23, 2019, https://thecustomizewindows.com/2017/05/wordpress-security-test-nmap-nse-scripts/.